Taken with Olympus E500 digital camera October 11th 2007. Click image for larger view. These shells are called Ocean Quahog (Arctica islandica) and I had to take a photo of them because I liked the way the pair was placed on the sandy beach. In Norwegian we call them Cow-Shells, probably because of their beautiful red/brown color. 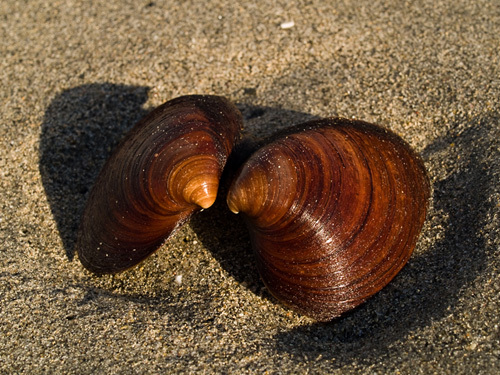 According to the Norwegian Wikipedia (the English version doesn’t have an article about ocean quahog shells) there have been found individuals of these shells that are as old as 220 years! Check out my macro photo of a limpet shell. 220 years old – I would love to see that one – must be huge! I love how the light looks in this photo. Great work! You know I love macro shots of marine creatures. The shadows alongside the shells in this shot really enhance the image. Well done (again)! It is so pretty and simple and this makes the picture so beautiful. Great work Thomas, as always!